It's so easy & we will choose a winner on May 30th. Lucky winner will receive a darling princess crown cookie cutter, 2 sweet teapot demitasse spoons, a package of PINK polka dot cupcake liners, and a beautiful vintage ladies handkerchief. All shown above. Good Luck! I am happy to be participating in the 3rd Annual Cottage Charm Giveaway. Click on the logo for more info and lots more fun giveaways! I love the embroidered hostess apron! I love your Cupcake Hankie Birthday cards...so unique!!! I really love the Blue Willow Tea Pot!!! So many wonderful linens, too! I absolutely love the Bright Red Cherries tablecloth. It's so cheerful! Hi Michele, I entered yours too, so sweet! well I loved just about everything in your store Nanalulu :)Some of my favorites though were the appliqued embroidered Ladies hankies in red. Thanks for such a great giveaway. Love the cherry totebag and the brown and pink polka dotted apron. Very cute! Love the bed linens! What a wonderful giveaway. Please enter me. Right away, I chose the SWEETEST EVER BABY BIB Mama & Baby Bird. My neice just had a baby and they are bird-lovers. They would love this and you have very lovely items. What an adorable give away ! Please enter my name. ooops....almost forgot...I love your princess crown cookie cutter....I've never seen a cookie cutter like that one before and need it to add to my pile! Your website is just lovely. I absolutely adore the KITTY KITTENS CATS Childs Hankie So Cute!. Of course I am a cat lady, so I always vere there. Love that shabby chic rose apron.. Gorgeous..
Come on by my blog and Enter to win a Mother/Daughter Apron set.. I just love all of the things on your website, especially the tatted doilies! I promise when I saw your store, your things took my breath. My favorite is the Buttery Yellow tablecloth Bright Red Cherry Fruits. wow love all the vintage things in your store, I'm especially fond of aprons. would love to win your giveaway. Wow - I'm impressed by the sheer size of your stock on your website! I perused the children's handkerchiefs because I don't seem many of those. My favorites were the three kittens with the butterflies, the little red riding hood hankie (great colors!) but most of all the Beauregard Borden cow getting a bath -- my mother worked for Borden's in San Francisco and so the image is special to me. Thank you for offering such a nice giveaway! I am so very happy I followed the list to your blog! My button club is holding a "tea" for a neighboring state button club and I saw a number of items I can really use. I bookmarked your page..I will return. What I marvelled at was the lilly of the valley hanky, and everything in the fairy party: sugar tongs, cupcke wrappers. teapot cookie cutter.....AND love your giveaway package. cute giveaway, sign me up please. thanks for all the nice comments! Good Luck to all! Oh how wonderful! My absolute favorite item in your webstore is the Cottage Pink Roses Jadite Green Retro Tablecloth! There, I said it. I try to collect as many of these tablecloths as I can and I use them on my Cottage Porch all summer long. Be sure and visit me for my giveaway, too. I love the pink polka dots on brown Apron!!! My favorite item (amongst many) is the adorable RED & White Polka Dot Bib Apron Heart Pocket Classic Cutie! I really love the sweet Parasol ivory Battenburg Lace Umbrella! So beautiful! 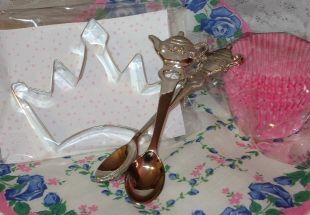 This Princess crown cookie cutter my little girl would love! We bake all the time together! Thank you so much for entering me in your giveaway. Wow, there are so many wonderful items in your shoppe. I love the Buttery Yellow tablecloth Bright Red Cherry Fruits, it's adorable! What a sweet giveaway; thank you for the chance to enter! I love this giveaway! The crown cookie cutter is so cute!! I absolutely love linens and have drawers full- I put your shop website in my favorites to come back and really shop! So glad I found you! What a great giveaway. With it being your first one I do hope you are enjoying it. One of my favorite items is the Beautiful Monogrammed Initial R Handerkerchief in Red. Please sign me up. I'd be delighted to win your goodies. Oh, I would love to be entered!! What a great store!!! One of my favorite items is the White Lace Hydrangea 30" Round Tabletopper Table Cloth. It's SO PRETTY!! Great giveaway, too! I'd love to be entered please. My heart stopped when I saw the cherry placemats and napkins! Lovel your items!!! !Please enter me in the giveaway. Thanks. Have to say that I loved all the ideas you showed for using hankies but loved the lily of the valley hankies. I can remember my mom having one like this when I was little and it being a favorite of hers. Please enter my name in your great giveaway. Thanks! What wonderful, precious goodies you are giving away. And what a wonderful site you have - I am in love with the white embroider sheets and pillowcases, and craving those precious cupcake liners. Please enter my name in your giveaway and then make sure to pick me!! I loved most everything I saw in your store. I really love the vintage style tablecloth with the cherries. I jsut love the crown cookie cutter, have to have it! I also love love love the gold tea set for fairies! What fun items, great shop! Thanks for visiting my blog! Your giveaway is lovely I would love a chance to win! Your shop is lovely! I especially like the vintage table cloth - that red ric rac is darling! Cute linens, love the cupcake hankies, and the red bird kitchen towel! What a wonderful giveway… please enter me. I love your aprons, the black damask one is especially pretty. Have a wonderful day. Bright RED Cherry Cherries Flower Berry Vintage Reproduction Tablecloth is my favorite! Love the cupcake/hankie cards...tooo cute!! Pleae enter me...I am having one as well if you'd like to enter it. What a great giveaway. It would be fun to make crown cookies! it is awesome and just my style, I have bookmarked your store.. Your generous gifts would make me SO happy. Thank you for sharing! I like the aprons and tablecloths/enter me please ~!!! Great giveaway! Love the shop too! the Hostess Apron PINK POLKA DOTS on Brown is adorable! Thanks for the chance! Linen Guest Towels. Very pretty! Thanks for the chance to win. so many things that i loved - the aprons, the vintage looking cupcake liners...please enter me to win! The parasols would be a perfect prop for photoshoots with my little girls. They will go ga! ga! over those. And my princesses will love your giveaway too! Oh I must have the pink Cherries table Cloth. I would look great in my home. I am going back to check your sizes. Thanks for participating in the give away. You will make some one very happy. I love the Buttery Yellow tablecloth Bright Red Cherry Fruits and the Crown Shaped Key Encrusted Topaz RHINESTONES Beads CHIC.I love it all.Please enter me. Hi! I'd be so excited to win this giveaway. I really liked the lace tea pot cozy in your shop because it's super cute and I haven't ever seen one I really liked until now! At first I thought you were from Mass. because the ad says "Let's keep jobs and growth in Massachusetts"! I'm from Mass. What a lovely giveaway! That crown cookie cutter is great! What do I like best from your store? Besides all the cherries and red items? All the cherries and red items! LOL! I love the lovebirds and picket fense wrappers. I have always wanted those to incorporate with my cupcake pin cushions! I am in love with vintage handkerchiefs! I hope you got a chance to check out my giveaway! I love the cupcake cutout napkin cards. They are so cute. The difficult part would be GIVING the cards rather than putting them on display. Count me in I would love to have a chance to win your nice gifts. You can go to my blog and enter to win, if you haven't already. What a lovely shop. Love all of the aprons especially the Vintage Cherry Cherries Tablecloth Fabric apron. What a wonderful shop. I'm glad I found you, I'll be ack to visit. My favorite item was the vintage inspred cherry tote. I really enjoyed the collecting lily of the valley hankies too. I adore the linens and aprons. Please enter me in your wonderful giveaway.